Review: Moana, a young girl ventures out to sea on a mission to save the future of the people of the Pacific Island on which she lives. She goes in search of Demigod Maui who then guides her in her quest to become a master way finder. I really liked this. I actually laughed quite a few times and the comedy scenes worked really well. They took me by surprise. It is lovely to see an animation as good as this that the whole family can sit down and enjoy. Ron Clements and John Musker both directed The Little Mermaid (1989). If you look carefully there are quite a lot of similarities between this and Frozen (2013). 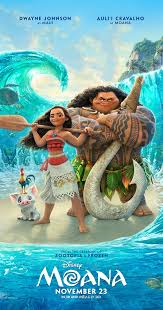 I really enjoyed the songs and found them really catchy especially the “I am Moana” song. By the end of the film I was singing along to them all. This is a PG rating because there are actually some scenes in this that are quite scary especially for young children. I found all the characters to be likable. There wasn’t one where you took total offence to. I even loved the chicken and the little pig. This is Dwayne Johnson’s first feature musical. If you look carefully the spiral symbol on Moana’s necklace and on the sail of her boat has got a name and is called a koru and symbolizes new life, new beginnings, personal growth, hope, a new start, perfection, rebirth, awakening, purity, the spirit of rejuvenation and peace.